The time for Robert Griffin III and the Washington Redskins to win is now. The Washington fans and media are throwing words like “development,” “progress,” and “potential” around as if the Redskins are turning into the Wizards, who don’t try to win and only look to the future. This “We’re not worthy” attitude is getting tiresome. It’s true that expectations were often unreasonably high in the early and mid 2000s when Dan Snyder spent unwisely on veterans and the team drafted poorly. But the pendulum has swung, and the team has invested in youth while ensuring continuity among the coaching staff for the second time in the last three regimes. It’s time for D.C. to get rid of its loser inferiority complex and demand results. Sports is about production and winning, not about “progress.” A writer for the dominant paper in town wrote a month ago that the Redskins shouldn’t expect to contend until 2014, and that two more losing seasons, for a total of five consecutive, would be acceptable. Sorry, that’s loser talk. Things can and do turn around overnight in the NFL. The writer went on to say that RGIII’s development is all that matters. Hogwash. Winning is all that matters. What about the other 52 players on the team? What about the fans? All of those quarterbacks led their teams to big turnarounds their rookie seasons. In fact, each one of them led their teams to at least four more victories than the previous season, while Sanchez’ Jets had the same record but advanced to the AFC title game. What about Ryan and the Atlanta Falcons? Matty Ice improved Atlanta from 4-12 to 11-5 in 2008 while throwing for 3,440 yards. That same season, the Baltimore Ravens, who have been infringing on Redskins territory for more than a decade, went from 5-11 to 11-5 under Flacco. In 2010, Bradford’s St. Louis Rams improved from one win to seven while he threw for 3,512 yards. Last year, Dalton helped the perpetually pathetic Cincinnati Bengals to a 9-7 playoff year after finishing 4-12 the year before. And Newton led the Carolina Panthers to six wins after the team won just one in 2010. Newton and Dalton did it without the benefit of minicamps. (Dalton, it should be noted, was a second-round pick). To be fair, three rookie first-round quarterbacks didn’t set the world on fire last season, including Jake Locker (Tennessee Titans), Blaine Gabbert (Jacksonville Jaguars) and Christian Ponder (Minnesota Vikings). And Tim Tebow of the Denver Broncos didn’t play much until the final three games of the 2010 season. The only other first-round quarterbacks since 2008 who didn’t lead their teams to major turnarounds their rookie years were Josh Freeman of Tampa Bay and Matt Stafford of Detroit in 2009. But Stafford is now an elite quarterback, and Freeman is considered an upcoming star by many NFL experts despite a poor season in 2011. So of the 11 quarterbacks selected in the first round between 2008 and 2011, five of them led their teams to significantly better seasons than the previous year. Add second-rounder Dalton and half of the quarterbacks picked high fall into that category. So it’s inaccurate to say that rookie quarterbacks always fail. Let’s also remember that RGIII was the second player picked overall in 2012. 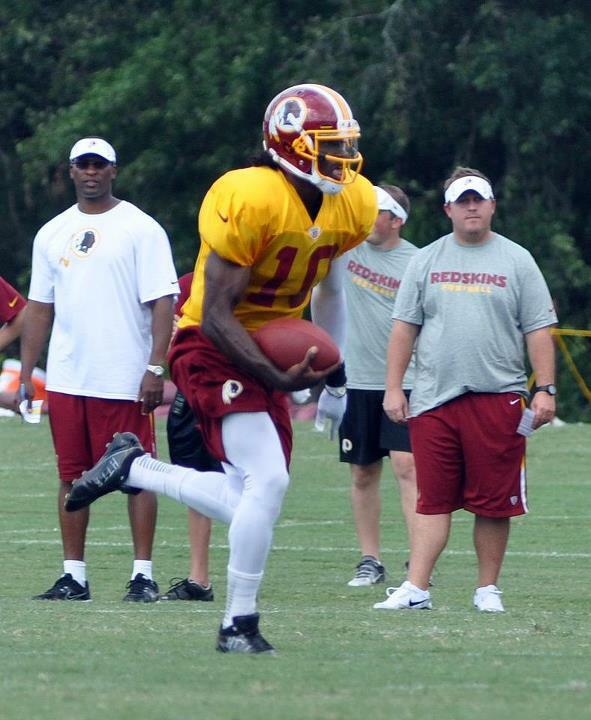 None of this means that RGIII is going to turn around the Redskins in one season by himself. But let’s not give the team a eulogy and give up on them like Wizards players, coaches, ownership, media, and fans do every year, giving them a free pass to lose as much as they can. The Charlie Brown attitude in D.C. is so prevalent that virtually nobody in Washington predicted the playoffs for the 2012 Washington Nationals, who are running away with the best record in the majors. Anyone could see this team had an excellent starting pitching rotation. But the sports radio “experts” were afraid to predict the playoffs, expecting a season slightly above .500, with 2013 a target for the postseason. Fans and media whine all the time about the Redskins’ offensive line and secondary. The team hasn’t done as much as it could have to address the line, but Washington was hamstrung by the salary cap penalty the NFL levied last spring. The fact is that most NFL teams are flawed. The way to overcome the offensive line is to shorten plays so they aren’t slow developing like they were during Donovan McNabb’s season with the Redskins. If the Shanahans haven’t figured that out by now, they should be fired at year’s end. Washington has good talent at the most important positions on the field. After quarterback, pass rushing defensive ends or outside linebackers are among the most important positions with the emphasis on the passing game in today’s NFL. While Stephen Bowen and Adam Carriker are solid if unspectacular, Brian Orakpo and Ryan Kerrigan are excellent pass rushing linebackers. Second-year defensive end Jarvis Jenkins should add some extra push along the line. Left tackle is also considered one of the most important positions. While Trent Williams won’t make anyone forget Joe Jacoby, Jim Lachey, or even Chris Samuels, the first round pick is probably at least better than average. Kicking gets no respect, but with talent levels fairly even in the NFL, kickers can make a huge difference. Neal Rackers should make the team over Graham Gano. If he does, the Redskins will have a kicker whose career field goal percentage of 80, while less than the league average, is considerably higher than Gano’s career average of 73.8. That right there is good for at least one more win per season. The Redskins actually have good talent at the skill positions. With young receivers Pierre Garcon, Josh Morgan and Leonard Hankerson to go along with old reliable Santana Moss in the slot, RGIII should have plenty of targets. Fred Davis is one of the better tight ends in the NFL. At running back, Roy Helu and Evan Royster have quick feet and better pass catching ability than recent Redskins running backs. If Tim Hightower is healthy that’s a bonus, and rookie Alfred Morris has been a pleasant surprise. Teams don’t need a 1,000-yard rusher anymore. It’s better to have several options. The defense improved from 31st in 2010 to 13th in 2011 under Jim Haslett, and this will be the team’s third season under the same offensive and defensive systems. The NFC East is overrated. There are no bad teams, but no dominant teams. The New York Giants finished with a 9-7 record, the same as the non-playoff Tennessee Titans. The Giants gained a potential star running back in rookie David Wilson but lost a top receiver in Mario Manningham. The Eagles still have questions surrounding the offensive line and the health of Michael Vick. Dallas is an 8-8 team despite its mystique. Yes, the time for the Redskins to begin winning is now. Anything less than a 9-7 record will be a disappointment, and the players, fans, and media should treat the team that way. Forget “development” and “progress.” Those are words for losers. Winning is the name of the game. This entry was posted on August 26, 2012 at 9:19 pm and is filed under Uncategorized. You can follow any responses to this entry through the RSS 2.0 feed. Both comments and pings are currently closed.